Si nunca ha esquiado antes o no domina el deporte, esta clase de esquí de fondo para principiantes en Tromso es ideal para usted. Lo recogerán desde Tromso, y lo conducirán unos cinco minutos a la estación de esquí. Su guía le facilita el equipo que necesita, y se asegura de que se sienta cómodo en él. A continuación, aprenda los principios básicos del esquí, y empiece por terreno plano. Si se siente con confianza también puede gradualmente subir pequeñas colinas y desafiarse a sí mismo. My parents and I booked this tour in Feb 2018. I highly recommend this class for anyone who wants to try skiing. My Dad was 69 at the time and had never skied before we are from Australia and don't get any snow where we are from. Our instructor, Joel, was extremely helpful and patient. He explained everything and was happy to answer any questions. During the lesson you could see everyone gradually improving, which was great to see. The location is also picturest, not far from the centre of Tromso but far enough to feel like you are out in the woods. Joel made the lesson fun and was enjoying himself also. We'd all like to thank him for the experience. It is the instructor that can make or break these type of tours and Joel was fantastic. THANKS JOEL!! Had a great time learning how to ski despite falling a few times. Great Fun! Great guide, great snacks, overall a memorable experience. Ski novices and treated well. Saw real progress in the blizzard! Great fun. 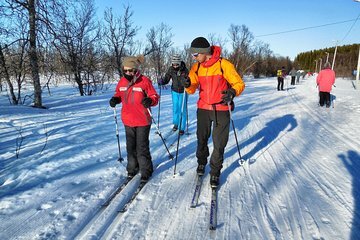 guided cross country ski trip in tromso really suit beginner who would like to try ski, the course is easy and funny, most important of all, the instructor is very professional and friendly. This course was perfect for someone who had never skied before. The guides provided a lot of instruction on how to best move and improving your form. It is a nice workout so make sure you're prepared for getting your heartbeat up.